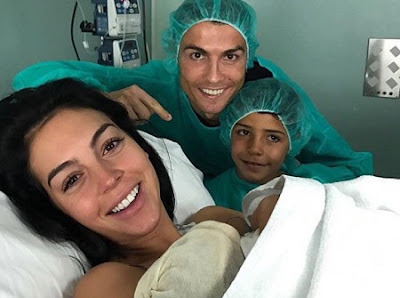 Cristiano Ronaldo is officially a father of four. The soccer star’s girlfriend Georgina Rodriguez gave birth to a baby girl they named Alana Martina, he announced on Twitter and Instagram on Sunday. Additionally, Ronaldo shared a photo of himself, Rodriguez, and his 7-year-old son Cristiano Jr. posing with baby Alana in the hospital. This is the couple’s first child together. In addition to Cristiano Jr., the soccer heartthrob is dad to 3-month-old twins – whose names are reportedly Eva Maria and Mateo. They were born in June via surrogate.